including an exploration of the pipe chamber! Because Fourth Church’s 1971 Aeolian-Skinner Organ, Opus 1516, had been deteriorating for some time, in January 2012 the Elizabeth Morse Charitable Trust, one of this church’s longest standing and most generous benefactors and very generous supporter of the arts in Chicago, offered a $1 million matching grant as a springboard to financing a $3 million organ project. Thanks to widespread support from so many, including a generous gift from Edie and Ed Andrew, we successfully reached the $3 million goal by the end of September 2012 and initial work began on the organ rebuilding project. In recognition of the Andrew’s longtime support of Fourth Church music programs—including not only their gift to the organ but also their launching and endowing Tower Brass as an ensemble of Fourth Church—the rebuilt organ is named the Edith G. and Edward J. Andrew Pipe Organ. In addition, U.S. Equities was engaged to provide project management. U. S. Equities has been a Fourth Church partner of the years, most recently serving as project manager for planning and construction of the Gratz Center. The U. S. Equities team has overseen scheduling, sequencing, site preparation, and the various subcontractors (architectural, structural, mechanical, electrical) necessary to complete the work. In late 2012, the design and preparation phase—which included purchasing material, aging wood, and constructing components such as wind chests, pipes, and the console—began. In August 2014, the Aeolian Skinner organ was removed and sent to the Quimby Organ Company in Warrensburg, Missouri. An electronic organ was placed in the organ loft for use through late 2015, at which time the newly rebuilt organ will be installed and ready for use. In January 2015, work began in the South Balcony. In order to make it easier for the sound from the pipes in the southwest chamber to be heard (the walls of the pipe chamber are 29 inches thick! ), some of the west wall of the South Balcony was opened to the chamber behind to make a new tonal opening. This was done in such a way as to maintain the architectural integrity of the space. The new opening is about five feet wide and eight feet long but is not visible in the room, since it is behind the first arch in the South Balcony. The bottom six murals in this arch were carefully removed and have been replaced with digitally produced replicas of the mural images, printed on a screen much like the fabric over a stereo speaker. This screen allows the sound to pass through. Architectural preservationists oversaw the removal of the original mural sections. The desire is to display that artwork somewhere on our campus—as we have done with the stained glass from the former Blair Chapel—thereby affording a “ground level” view of these panels. In early August 2015 the installation process—which will take several months—began. The week of August 3, 2015, delivery of pipes began, and on Wednesday, November 11, the new console was hoisted into the choir loft. On Sunday, November 22, the Andrew Pipe Organ was used to lead worship for the very first time, and it was dedicated to the glory of God during the 11:00 a.m. service of worship. On Friday, March 18, we celebrated this magnificent new instrument with a concert by John Sherer that was part of a series of dedicatory concerts taking place in the first half of 2016. Each November a concert marks the anniversary of the Andrew Pipe Organ’s dedication. Where was the organ built? Quimby Pipe Organs is located in Warrensburg Missouri, about an hour east of Kansas City, Kansas. The pipes from the Aeolian Skinner were cleaned and repaired there, and new pipes were hand made there. Each new pipe had to be rolled into its form and then carefully made to sound the desired way. Since no two organs are alike, this was a time-consuming undertaking. The console was made near St. Louis by Jim Schmidt, and the electronic control mechanisms and combination action for the organ were made in Atlanta by the Virtuoso Company. What preparations were made on site for the installation of the organ? In addition to the work done on the South Balcony, the North Balcony was prepared for one division of the organ, the Positiv. The façade of this division mirrors the façade in the South Balcony, providing symmetry to the room. In the antiphonal division of the organ, which is located in the back of the Sanctuary, above the east window, solid walls were built around the pipes to focus the sound of the organ into the Sanctuary and also to protect the pipes from significant shifts in temperature. In the basement of the church, painting, cleaning, and installation of a humidification system took place to prepare for the new blower for the organ. The main pipe chamber itself, located in the chancel, was also painted, cleaned, and made ready for the pipes to arrive. What does the new organ sound like? The rebuilt organ has a great deal more warmth, foundation tone, bass frequency, and color than the Aeloian-Skinner organ did. It has new delicate symphonic colors such as a harp, an English horn, and lots of lush string tones, and bells, called zymbelsterns, and an additional set of chimes has also been added. The organ is an American symphonic organ with a great deal of influence from the British organ builders, T. C. Lewis and Henry Willis. It is able to play anything but is most at home accompanying congregational singing, choir anthems, and any organ literature. Is there a new console for the organ? Yes, there were so many problems with the keyboards and combination action—the memory of the organ—on the previous instrument that there was no choice but to completely replace the console. 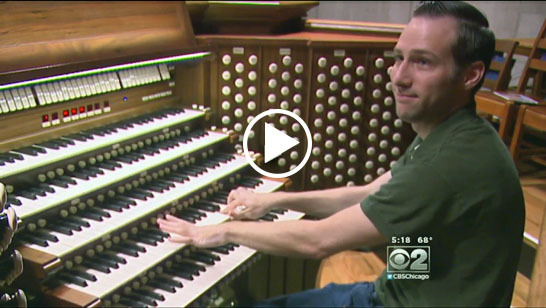 The new console is the only organ in Chicago—and one of the few in all of America—to have five keyboards, or manuals, for the hands to play. These keyboards along with the pedals control nine divisions of the organ (the previous organ had seven), which is another reason for the need to upgrade to five manuals. The combination action has 10,000 memory levels (whereas the previous organ only had four, and they were at times unreliable). With this completely unlimited memory, multiple organists are able to use and save their presets on the organ on a regular basis. Have we raised all the funds for the organ? Yes, thanks to the generosity of so many people here at Fourth Church and beyond we have raised all the necessary funding! We allocated a year to raise the $3 million required to do the organ project and in just seven months had raised the full amount. The William Morse Charitable Trust gave Fourth Church a matching grant intended to get us to the $3 million dollar goal and gave a dollar for each two dollars we raised. Hundreds of members supported the vision of a rebuilt organ. Among them, Ed and Edie Andrew generously gave a million dollars. For their love and ongoing support of the music program at Fourth Church, including Tower Brass, the organ has been named the Andrew Pipe Organ. Is this the largest pipe organ in Chicago? Yes, the organ has 143 ranks, 8,343 pipes, and is the largest not only in Chicago but throughout the Midwest. For many years Fourth Church had the largest pipe organ in Chicago, but Rockefeller Chapel, has held that title for about ten years with 132 ranks. Most importantly, though, is this will be an organ that will inspire people, bringing them closer to God with its expressions of majesty, sorrow, and joy. It is an organ that supports congregational singing much more effectively than the previous organ. Who at Fourth Church has helped with the project? Staff members John Sherer, Marty Sherrod, Leszek Pytka, Ann Rehfeldt, and Shannon Kershner were all involved in ongoing work related to the organ project. Fundraising was achieved with the help of Katy Frey Bever Frey, Kathi Rodak, Kate Solis, and many others. An Organ Task Force was begun in 2006, and an Organ Steering Committee was later formed, which in addition to staff members mentioned above consisted of Anne Voshel, Don Allerton, and John Shorney. U. S. Equities was our project manager, and Threshold provided acoustical support. For more information about the organ at Fourth Presbyterian Church, contact John Sherer, Organist and Director of Music (312.981.3592).